There are very few organizations or people in the world that do truly wonderful things without any expectation of recognition of personal reward. Team Rubicon is one of the magnificent few. Team Rubicon is a Disaster Response Veteran Service Organization. As in responding to disasters in places like the typhoon wracked islands of the Philippines, Haiti, Chile, Burma, Pakistan, Sudan, and in the United States. They are a growing group of dedicated veterans who bring the skills they learned in uniform (things like flexibility, teamwork, leadership, work ethic, dedication, sense of duty and commitment to duty) to a new form of warfare: fighting against the disasters that ravage communities and threaten the lives of innocent men, women, and children. They are incredibly agile, and are often among the first relief and assistance agencies to hit the ground. The credit for such agility is the committed deployability of the members of the team; they have all answered the call to arms for their nation and in doing so have become incredibly motivated, proactive, and prepared to grab their gear and catch a flight to wherever in the world disaster strikes. Today they are conducting Operation SEABIRD in the Philippines at the same time that Operation HONEST ABE is underway to help with the damage wrought by the tornadoes that blew through the region this past weekend. To say that they do amazing work is an understatement of epic proportions. They are the best our country has to offer, continuing to serve after hanging up the cloth of the nation. My hat’s off to them. To learn more, go to their website. Also, here is a link to a great story in Stars and Stripes. Orders to Nowhere: The Book! Coming soon! The launch date is expected by be no later than November 10th, but hopefully sooner. I’ll post a note as soon as it goes live. Written over the two years of navigating the often frustrating and always confusing waters of military transition, Orders to Nowhere is finally available in print! Orders to Nowhere is the essential insider’s guide to military transition. 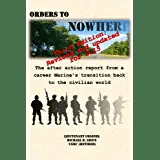 Demystifying the uncertainty and ambiguity that surrounds getting out of the military, Orders to Nowhere is the comprehensive After Action Report of a career Marine’s transition from the tightly knit military world back to civilianhood. Tens of thousands of Soldiers, Sailors, Airmen, Marines, and Coast Guardsmen transition back into the civilian world each and every year. The change from life in uniform to life beyond the military is a significant emotional event for everyone who experiences it. Hanging up your uniform for the last time isn’t easy, and Orders to Nowhere was written to help explain the overwhelming process and make it easier for military members planning to get out, while they are in the midst of transition, or after they become veterans. The book contains over 160 lessons learned and recommendations that can help anyone going through the military to civilian transition avoid making costly mistakes. The path back to “normal” life is anything but normal, and Orders to Nowhere is the traveler’s guide that every member of the military and veteran needs to ease the pain of the journey. A must for every man and woman in uniform to help make transition as smooth as possible! My VA claim was finally settled a month ago after about two years of waiting. I know it was settled because the VA sent me a very nice letter saying that it was, and along with my final disability rating came a brief paragraph that indicated that I would be receiving a settlement check from both the Defense Finance and Accounting Service (DFAS) as well as the VA. Intriguing, thought I. What exactly did that mean, and more importantly for my bank account, how much money were we talking about? In my case, I received no VA compensation until my case was partially adjudicated some ten months after the claim was filed. During that time I was receiving my full military pension. On the tenth month of the life of my disability claim the VA made a partial determination in my case. They rated me at a low level for a few conditions, but they needed to conduct more examinations to determine if I was eligible for a higher rating. The bottom line was that now I was eligible to receive some compensation from the VA.
Let’s say that you receive a disability rating that results in a payment from the VA of $100. That $100 is not added to your check for a total of $1600. Instead, $100 of the $1500 that was paid by the Defense Finance and Accounting Service (DFAS) is now paid by the VA, so the total pension amount stays the same. What changes is how the taxes are computed. $1400 x 20% = $280 in taxes. $1400 (from DFAS) + $100 (from the VA) = $1500 (which is your pension amount). $1500 (pension + VA Disability) – $280 (taxes) = $1220. Sooooo…..as a retiree you get an extra twenty bucks in your monthly check. If you are not a retiree, however, you get the full $100. Total amount of VA compensation that the veteran should receive in this case is computed by multiplying the number of months eligible times the final compensation amount, as follows: $200 x 22 = $4400. The amount of VA compensation that the veteran has received to this point is computed by subtracting the number of months he or she received compensation from the total months eligible, and then multiplying that number by the partial settlement compensation amount, as follows: 22 – 10 = 12 months: 12 x $100 = $1200. Now that we know how much the total amount of compensation the veteran is eligible for ($4400) and the amount of compensation that he or she has already received ($1000), we can determine the settlement amount from the VA by subtracting the amount received from the total amount: $4400 – $1200 = $3200. So the veteran will receive a tax free check for $3200. Sweet! From the problem above, you are about to receive a check for $3200 from the VA. DFAS has already deducted the taxes for the first $1200, but has not done so for the remaining $3200. In effect, you have been paid that amount and been taxed on it, so DFAS needs to cut you a check for the taxes (assuming a 20% tax rate as used in the problem above): $3200 x 20% = $640. Unfortunately, since you are retired and not simply out of the service you don’t get $3200. You get $640. Not as sweet, but still a nice chunk of change. Since you are eligible to receive both checks, you will receive your full settlement check from the VA as well as back pay for the pension amount that was deducted and replaced by the monthly VA claim amount, less taxes on that amount. Sounds complicated, but it really isn’t. The math looks like this: (Full VA settlement amount) $3200 + (Pension amount deducted and replaced by the VA) $1200 – (taxes on the pension amount deducted and replaced by the VA) $640 = $3760. If your brain hurts, that’s ok. The bottom line is that the DFAS and the VA are sending you a check that will cover the cost of whole lot of aspirin.